Since the entry into force of the RGPD (General Data Protection Regulations), the management and security of Internet users' data has become a little more central to digital news. Nevertheless, according to a study conducted by HideMyAss! (HMA!) the VPN provider, nearly one in two French people (48%) do not consider privacy as a fundamental right. Yet 66% of the respondents in the same study believe that access providers, police services and the government can access their history and activities online without their knowledge. 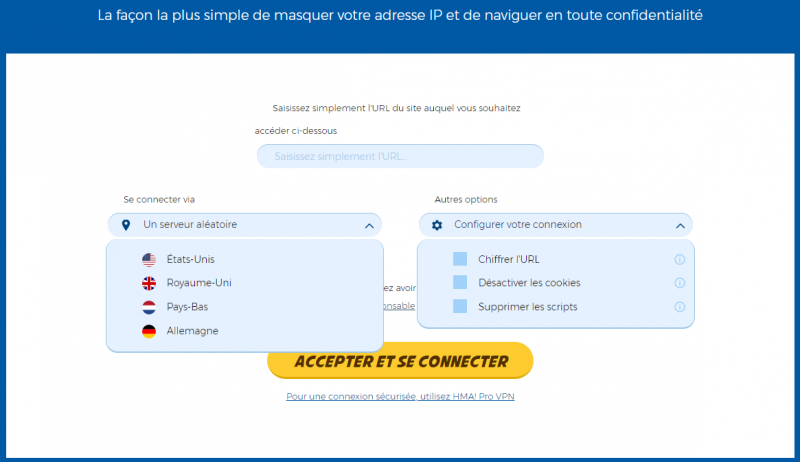 The VPN provider starts from the observation that French people are concerned about their online privacy to present a new solution. The latter allows you to bypass geographical restrictions via your browser while hiding your online activity. It is not a VPN service but a Web Proxy that can be used from any web browser. The free HMA proxy! Allows the user to route browser traffic to other servers and IP addresses around the world. Featured image and HMA screenshot! A total of 4 countries are available: the United States, the United Kingdom, Germany and the Netherlands. This means that when the user connects to one of the servers, he or she is virtually in one of these countries and has a new online identity. So, if you want to visit American sites blocked in Europe following the entry into force of the DGMP, all you have to do is go to the HMA! service site. Note that this proxy uses the HTTPS protocol which better protects the protection of the Internet user's activities is online. Be careful, a proxy is not a VPN, and does not guarantee total anonymity on the web. For example, this proxy does not take into account the protection of P2P exchanges, does not secure any banking transactions and is not compatible with all devices, games and applications. Also read: Which free VPN is really free?